Construction of the first phase of the project, 54 social homes, is due to commence in the coming months. THE LONG AWAITED redevelopment plan for St Teresa’s Gardens in Dublin has been launched this afternoon with plans for the first phase of 54 social housing units. Commissioned in 2017, the three-year strategic plan outlines how the St Teresa’s Gardens regeneration board and the staff team will work on the project. The regeneration project was first earmarked for work in 2005, but it has since been delayed on numerous occasions. 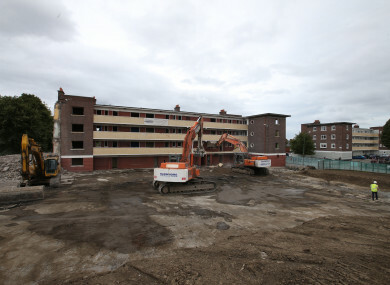 The last of the old flats at St Teresa’s Gardens were torn down in September 2016 after standing for more than 60 years. The Department of Housing added that over the lifetime of Rebuilding Ireland, some €211 million will be made available under its regeneration programme for the provision of more than 1,000 additional homes. “Regeneration goes beyond mere bricks and mortar,” English said. Last week, the government’s new Land Development Agency was formally established. The agency aims to build 150,000 homes over 20 years, using funding of up to €1.25 billion. However, groups such as the Simon Community has raised concerns about 60% of public land going towards private housing development. Speaking at the launch, Housing Minister Eoghan Murphy said the new agency has already identified eight State-owned land sites and secured agreements for development. These include land banks at Dundrum Central Mental Hospital (CMH), Skerries, Balbriggan, Devoy Barracks in Naas, Dyke Road in Galway, St Kevins in Cork City, Meath Hospital in Dublin 8, and Columb Barricks in Mullingar. Email “Regeneration plan launched for Dublin's St Teresa's Gardens”. Feedback on “Regeneration plan launched for Dublin's St Teresa's Gardens”.